Stanton Library provides free access to the Ancestry.com Library Edition website for people visiting the library. There are also many free family history websites online, we all know, but not many people realise that the library has a quite a few crucial genealogy resources that are not on available on the internet. There are many things specific to the North Sydney Municipality as you would expect but there are a few other things that can only be viewed in the Heritage Centre of Stanton Library. For example, if you were looking at the ‘Australia, Electoral Rolls, 1903-1980’ set of records on the Ancestry.com website you might not realise that NSW electoral rolls from 1903 to 1930 are not included. For a genealogist these are the most crucial years of our country’s most populous state. We have the years 1903, 1906, 1908, 1909, 1913, 1915 and 1916 available here on microfiche at Stanton. 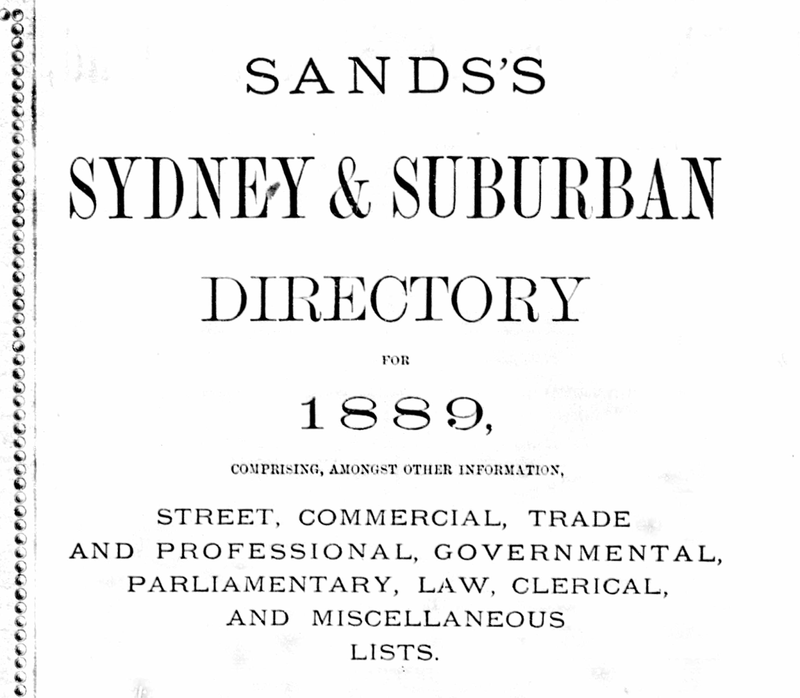 The Sands Post Office Directory 1858-1932 for Sydney is available on Ancestry.com library edition but it only covers 10 years 1861, 1865, 1870, 1875, 1880, 1885, 1900, 1910, 1920 and 1930. In some of those years the directory is not complete with either the street listing or alphabetical name listing having been left out. Stanton Library has an almost complete set of 71 of the 72 years on microfiche. Searching Sands electronically on Ancestry.com does have it’s advantages of course. The Optical Character Recognition (OCR) feature that Ancestry.com uses will scan thousands of pages for the name you are looking for in an instant but remember you are only searching 11 of 72 years. Also finding your search result can take a while as Ancestry doesn’t mark where it is located on the digitized page. The NSW Telephone Directory 1889-1972 and the Sydney Telephone Directory 1973-1985 are also available on microfiche at Stanton. Of course it took a while before telephone ownership became as ubiquitous as it is today. The earlier years have few entries. Initially it was the wealthy people and companies/organisations that had phones. Phone books would eventually take over as the best resource to find people and Post Office Directories disappeared. Sydney Sand’s Directory last year of publication was 1932. Tasmania’s Wise’s PO Directory ended in 1947. New Zealand’s Wise’s directory ended in 1955 (I guess it took them a while to ‘get the phone on’). Today, with there being no phone directory for mobile phone numbers and with fewer people having land lines telephone books have fewer entries and are becoming less relevant. We are anticipating some problems ahead for the genealogical searches of the North Sydney Family History Group 100 years from now. But we're not panicking just yet. Stanton Library has many historic local newspapers on microfilm and in bound book form that are not available on the internet. The Mosman Daily from 1920 to present and The North Shore Times from 1960 to 2003 are the main ones that are not yet on the ‘Trove’ website. Stanton Library has many local newspapers where only a few years have survived such as The North Shore and Manly Times (1886-87, 1899-1901, 1902-07), The Quiz (1904-1905), North Sydney (1901) to name a few. The magical way that the National Library of Australia’s Trove website can reveal family stories with the entry of just a name and a few particulars is remarkable. There are a lot of pre 1955 local newspapers that are not yet on the website. There is a listing on the Trove website of newspapers waiting to be scanned which can be seen on their website. https://www.nla.gov.au/content/new-titles-coming The Mosman Daily is not even on the list so it could take a while. We look forward to when every Australian newspaper is on the site. http://www.epage.at/ business and personal webpages from australia.